He’s currently on my desk at work because I’ve been carrying him around in my backpack since I found him lying in the middle of my bedroom floor. What’s odd about this is that my chess table was sequestered in the corner of my bedroom, obscured by my coffee table which was supporting a rather large TV at the time and the possibility of a chess piece not only escaping the confines of the table but also traversing halfway across my bedroom was pretty far fetched. I mean, granted the rook hangs out at the edge of the board so he does have the greatest chances for escape, but managing the rocky terrain of the coffee table and the stacks of books and DVD’s I had surrounding the area? At his size? Unlikely. I picked him up, set him on my desk, and considered him for a moment. One of my housemates came up just then and with a puzzled look on their face asked what I was doing. Apparently having someone living in your house who sits in the solitude of their room in the dark and the silence staring at chess pieces is cause for concern. Their puzzled expression remained unchanged. No one understands me. I decided the rook was just looking for someone to hang out with, so I set him on my keyboard, went about my business. I put him in my backpack, took him to work the next morning. I thought the whole affair was rather amusing. Made a Facebook post about it to see if anyone thought it was as amusing as I. 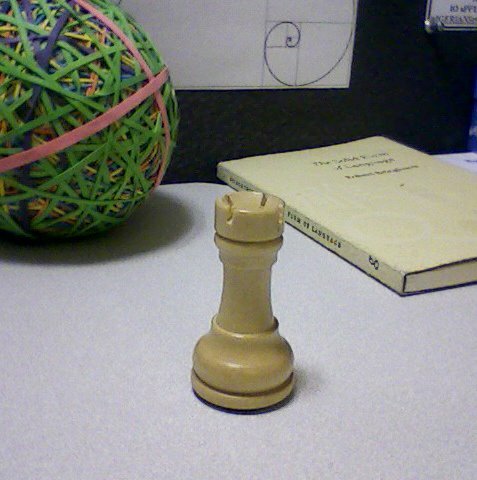 Theories were posed as to the cause of the ostracization of the wayward chess piece but nothing conclusive was reached. This caused a great deal more confusion in me which the original situation that began this entire narrative failed to achieve. When I read this, I picked up the small, wooden castle-shaped item and after close scrutiny failed to see what this woman was talking about. I had no choice but to Google “rook” and see if there was some other definition of the term to which I was previously unaware of. I was simultaneously relieved and grossed out. I tried to imagine what her mind conjured up when she read my Facebook post: my bedroom floor, a medium-sized black bird, writhing and twitching in the throes of death in the middle of the carpet, perhaps flown in through some random window. me, butcher knife in hand, sawing off the poor thing’s head, eyes bulging wildly, wrenching the wings from it’s poor lifeless body, tossing its useless torso aside, head and wings held up in victory as I scream, “yes! Yes you may have it’s head and wings! I have gathered them for you to…to…to do whatever it is you do with dead bird’s heads and wings!”. So. Hence the “A la chess. ‘Cuz, dude. I don’t do bird massacree’s. While I was at work I was determined to try and get my rubberband ball to balance on his head. I was repeatedly unsuccessful. Abject fail. Rook fail. 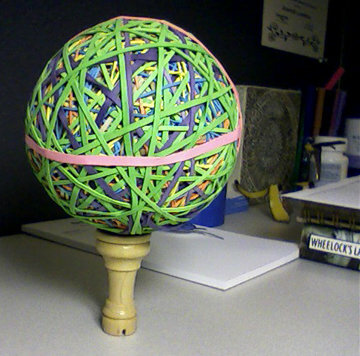 Rubberband ball fail. I found flipping him upside down seem to resolve the problem. Thought he looked a bit Atlas-ish. Peers had great fun strolling by and knocking his multicolored orb from his slightly unbalanced pedestal. Which bounces. Well. And for some distance. So this stupid little thing has been hanging out in my backpack ever since. Keep mistaking it for my lipstick. I recently rearranged my room and relocated the chess table. 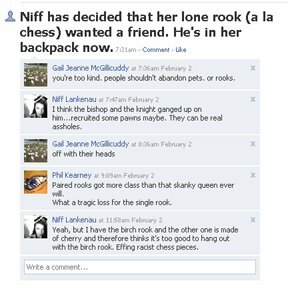 I asked some of the pawns if they knew anything about the rook’s exodus but they were less than forthcoming. They know something. Wee daft little bastards. I think more aggressive interrogation techniques may be required. >Can I just say this post was awesome? I can/ Cool. >Ha! Thanks! I had a bit of a dry spell, I thought I’d better come up with something good.